The tag 'Paperclip' is associated with 18 posts. The mafia began as a resistance movement focused against Norse (Viking) and Saracen (Turkish/Muslim) invaders in 12th and 13 century Sicily. It might seem incredible to the casual observer that an organization that began so long ago could have developed and spread to the size, gravitas and scope of operations that it has. We also appreciate that when Mr. Emory uses the term “Underground Reich,” it might seem odd or incredible to many. Bringing up to date “L’Affaire Snowden,” we underscore the deep politics underlying the CIA’s broadcast psychological warfare fronts and their evolution into the milieu involving and surrounding Eddie the Friendly Spook. Much of the material in this program is reviewed from previous broadcasts, presented here to provide depth and understanding to how what has been presented as a “progressive,” “enlightened” phenomenon could be its opposite. “Team Snowden” manifests fascism and the Underground Reich at every turn. A major element of analysis is the development of the CIA’s focal point networks in the 1950’s, resulting in the formation of a CIA-controlled “government-within-the-government.” Is “Team Snowden” evolved from the focal point networks? Next the broadcast reviews the formation of the Broadcast Board of Governors, an umbrella organization enfolding the CIA’s radio propaganda and psychological fronts formed during the Cold War. “Team Snowden” is inextricably linked with the BBG–Snowden himself worked for CIA when he decided to infiltrate NSA and leak its secrets. In that context, we note that the Gehlen organization was at the foundation of the formation of the propaganda/psychological warfare fronts under the direction of the BBG. Much of the program underscores the Gehlen Org’s links to the Underground Reich, in order to reinforce listeners’ understanding of how this network dating to World War II could project its influence through the decades and into our contemporary historical period. ” . . . A network of former Nazi intelligence agents, the majority of whom were members of the SS, began working out of offices at Camp King side by side with army intelligence officers. . . . The Gehlen Organization was a murderous bunch, “free-wheeling” and out of control. . . The army became fed up with the Gehlen Organization, but there was no way out. Its operatives were professional double-crossers and liars–many were also alleged war criminals–and now they had the army over a barrel. . . .” Discussion concludes with “First Look” media czar Pierre Omidyar’s selection of Robert Lietzke to be an Omidyar fellow (Lietzke was one of Edward Snowden’s superiors when he was employed at Booz Allen Hamilton.) Program Highlights Include: Review of the Crusade For Freedom–the covert operation that precipitated the formation of the Nazi wing of the GOP; the CFF’s use of Radio Liberty as a front for employing fascists and laundering funds; the continuity in the Nazi chain of command from the Third Reich to the Gehlen organization when it went to work for the U.S.; the Gehlen organization’s strong links to the Bormann capital network; the strong overlap of the Thyssen industrial family, its business partners in the Bush family, Allen Dulles’ CIA and the Bormann network; the Gehlen group’s initial re-incarnation as the eyes and ears of Army intelligence. 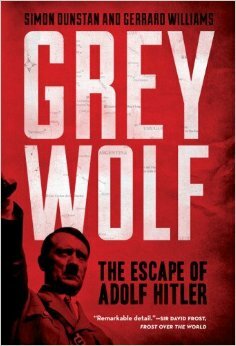 A recent book examines the very real possibility that Adolf Hitler may have escaped at the end of World War II–his “suicide” a carefully planned and executed ruse. Furthermore, the book highlights that gambit in the context of known collusion between the Third Reich and the Western Allies as the war drew to a close. The authors posit that the key players in the realization of Aktion Feurland–the code-name for the operation–were names well known to regular listeners and users of this website: Allen Dulles on the Allied side and Martin Bormann for the Third Reich. Centered on a quid pro quo arrangement, the authors hypothesize that Aktion Feurland involved the transfer of Nazi technology to the U.S. and the West (known as Project Paperclip) and the saving of priceless works of art from destruction, in return for the safe passage of Hitler, Bormann and other top Nazis. In this post, we examine the circumstances, personal history and political and professional antecedents of Alex Karp (pictured at right), the CEO of Palantir, whom we nickname “The Gruppenhobbit.” The dominant influence on Karp is the famous philosopher Juergen Habermas, an ostensible leftist whose intellectual antecedents are Nazi. The young Habermas was in the Hitler Youth and the Wehrmacht. Habermas was director of the Max Planck Institute for 12 years. That institution was the renamed Kaiser Wilhelm Institute, a fount of Nazi science and the epicenter of Josef Mengele’s Auschwitz research.